I have always thought that air conditioning units, although quite often necessary, have been some of the most voracious energy consuming appliances out there. Let's face it, an air conditioner has to do the same job that a refrigerator does. However, refrigerators only have to cool those nicely sealed interior areas of their own. Air conditioners, on the other hand, are required to cool large open spaces. Most of them do an admirable job, but they gobble up lots of expensive electricity in doing it. Today I finally found an air conditioner with an energy efficiency rating that I can respect. The portable unit that I discovered boasts an almost unheard of EER of 14.45! Get this; For an air conditioner to receive an Energy Star rating these days it must accomplish an EER of 10.7 or better. Most air conditioners in the 8,000 to 12,000 BTU range are posting energy efficiency ratings between 10.5 and 11.5, which isn't too bad compared to 10 years ago. However, the portable unit I'm writing about claims to deliver a full 12,000 BTU's, of cooling with an EER rating of 14.45, and all at a price below $400. And as if that's not enough, this well respected retailer offers FREE shipping on this unit within the continental U.S. The company, Air & Water, Inc., states that it ships most orders the next day. 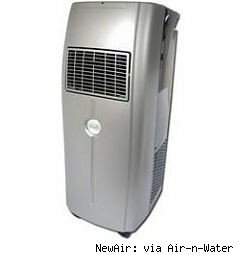 If you are in the market for cool air, I think it's worth your while to have a look at the AC-12000E NewAir Portable Air Conditioner at Air-n-Water.com. Not only is this a pretty good deal on 12,000 BTU's of portable cooling, but with an EER rating like this unit has, you'll save a lot of cool cash on your electric bill compared to the operating costs of those units which only offer an EER in the range of 11 or 12.